A few years ago, actress Emma Watson created an online bookclub on Goodreads called “Our Shared Shelf”, a place where people could read and discuss feminist books. It was around that time that I realized many people around me were not used to reading books written by female writers. Moreover, it seemed they weren’t even aware or couldn’t recall any female writers. It was easier to recall Ernest Hemingway, Tolstoy, F. Scott Fitzgerald or Franz Kafka than Virginia Woolf, Sylvia Plath, Ursula K. Le Guin or Emily Dickson. I also noticed this happened with living authors; many could not even remember a single book written by a women in the current day. Why is this important? Does this mean we have to stop reading books written by men? No, of course not. It means we could start reading more books written by women. There are many female writers - past and present - who write amazing stories. Maybe we simply haven’t met them yet. I found myself agreeing with most of these considerations but, if I recall my early twenties, most books I read then were written mainly by men. When I was younger, I used to keep many books written by female authors in my bookshelves (J. K. Rowling, Ursula K. Le Guin, Alice Vieira), but then, without noticing it, I started choosing books written by men. One of the reasons was my father’s library, which was largely written by men. Whenever I looked at his books, I would stumble across male writers everywhere. By my crude estimation, I’d guess only 20% of his books were written by women. So I started to buy more books written by female authors. I did not stop reading books written by men, but I wanted to know more female authors, so I searched and read a lot of these books. I found “Literary Witches: A celebration of magical women writers” while searching picture books about female authors. I wanted to find a picture book which celebrated female writers and their lives. I was curious with it because of its name: “Literary Witches”. I immediately remembered Emma Watson and her impersonation of Hermione Granger, the lovely witch created by J. K. Rowling. “Literary Witches: A celebration of magical women writers” does not give detailed information about all the female writers. Instead, it provides some peculiar and beautiful descriptions. The reader feels drawn to these unique descriptions which evoke surreal visions and stimulate the reader’s imagination. Katy Horan’s illustrations are full of details; Flannery O’Connor petting a peacock, Agatha Christie drinking her tea in a mysterious room, Anaïs Nin writing on her diary. This is not an extensive book about these women writers. You won’t find complete biographical information about each author, so I would not recommend it if you’re expecting a complete account of their lives. However, it is an interesting way of getting to know some amazing and lesser-known female writers. It also features authors from everywhere around the world, such as Yumiko Kurahashi from Japan, Janet Frame from New Zealand, Alejandra Pizarnik from Argentina, Forugh Farrokhzad from Iran and many others. Besides these small stories, Taisia Kitaiskaia also includes a “Recommended Reading” section, which features some of their best known books and anthologies. For instance, regarding Virginia Woolf, the author recommends reading “Mrs. Dalloway” and “Professions for Women” as the non-fiction feminist option. Overall, “Literary Witches” is a compelling book for everyone who wants to discover female authors in a different and unconventional way. Both Taisia Kitaiskaia and Katy Horan honor these wonderful writers with their words and illustrations. Its focus on female writers is in more than a couple of ways reminiscent of “Women in Science: 50 Fearless Pioneers Who Changed the World”, but with a mysterious and exoteric twist. Do you recommend some specific books about female authors? Feel free to share your opinion in the comments. When I was younger, I spent many hours at my local bookstore. Every week, my grandparents would give me a small amount of money to buy some snacks at my school. Instead, I would grab some bread from my lunch and save that money. Then, between classes, I’d run to the local bookstore, which was just around the corner, and pick a book. That moment was almost sacred: picking a book, looking at its cover, trying to imagine what kind of worlds existed in those pages. The bookstore was small and didn’t have many books, but for me it was one of the best and biggest places in town. It wasn’t the only one, though; I remember a few others, but eventually all of them closed while I was growing up. My local bookstore still exists, although its owners struggle in order to keep it open. I deeply love bookstores and books, so when I discovered this book, I immediately decided to read it. 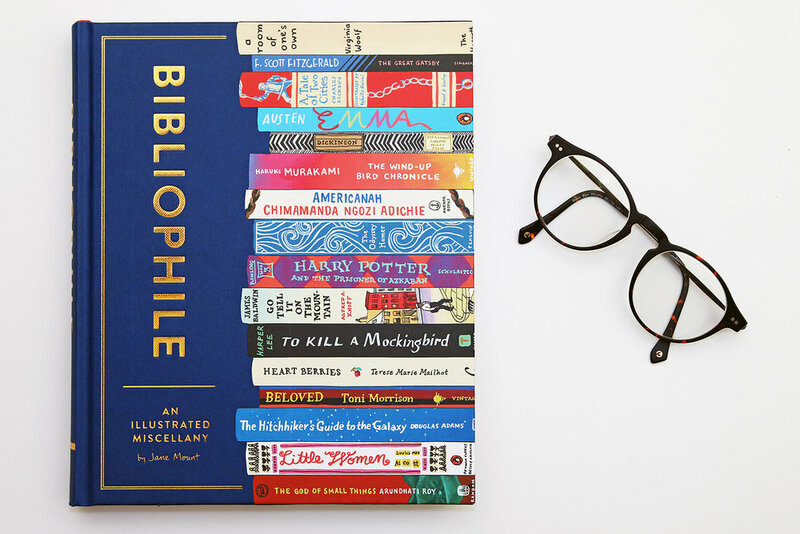 Bibliophile: An Illustrated Miscellany is a beautiful book filled with wonderful illustrations and great book recommendations. This hardcover edition is lovely. Bibliophile: An Illustrated Miscellany celebrates books, writers, bookstores, libraries and many other aspects that almost every person who loves to read will enjoy. It is a perfect book to read slowly and find some nice recommendations. Jane Mount’s illustrations of book covers, authors and even cats are so lovely that you’ll find yourself in a imaginary and giant bookstore. She will guide your through many wonderful shelves and will introduce you to new and old things. It is a perfect choice for everyone who loves not only beautiful illustrations, but also great content. This is a wonderful pick to everyone who enjoys books and reading because it covers many book genres, different bookstores and many other elements that people who love to read usually enjoy. It was one of my favorite books from 2018, and one which I’ll probably be re-reading often.